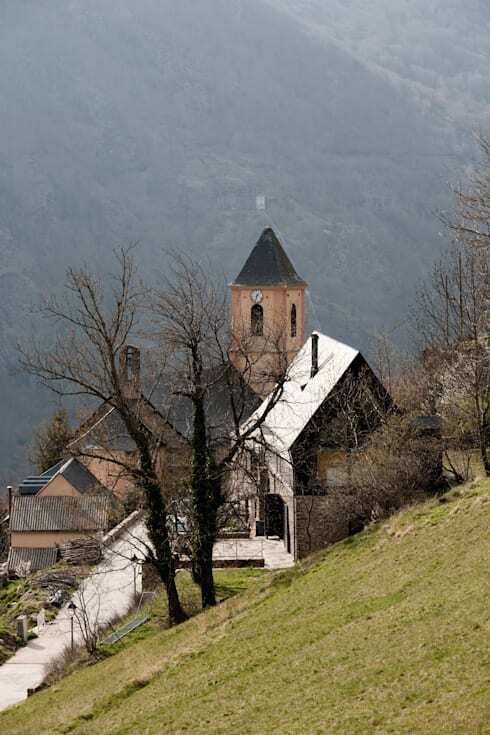 The project seeks to display the construction values of an old existing vernacular house made from dry stone – a traditional technique in this area of great tectonic value. 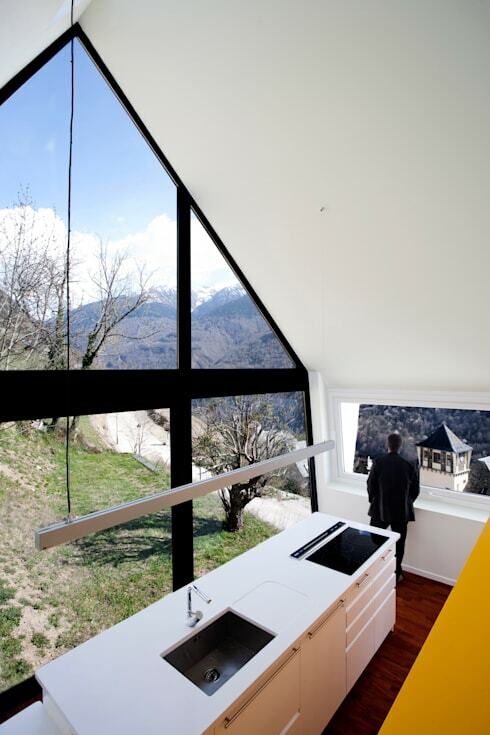 However, the distinctive attributes inherent to this construction technique (compactness, large mass, small openings, obscure interiors, weight) deny the extraordinary environment in which it is located: on top of a mountain, with views to two different valleys which are faced by the two façades of the house. 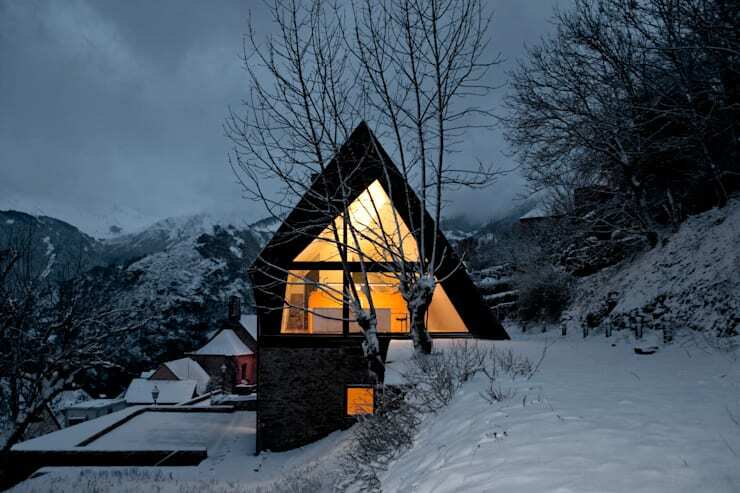 With a strong focus on how the shape and design of the home interacts with its dramatic mountainside surroundings, these architects have truly created a work of art in this unique home. A 360-degree tour of this home reveals that it's interesting from all angles, but this side view is definitely an eye-opener! 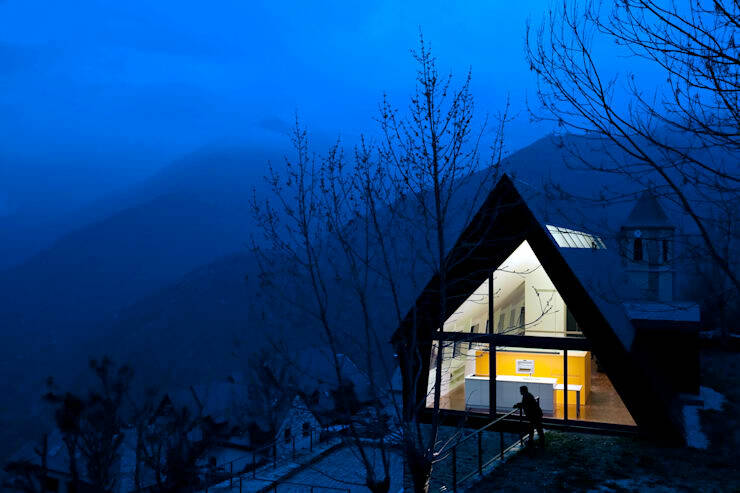 A glowing triangle of golden light is formed where a steep sloping roof meets the hillside, mimicking the peaks of the mountains far off in the distance. There are many stunning aspects of this home; one of the most stunning parts is certainly the setting! The home is nestled in a quiet mountainside village, on a steep slope filled with the traditional stone walls and tile roofs that have stood for generations. 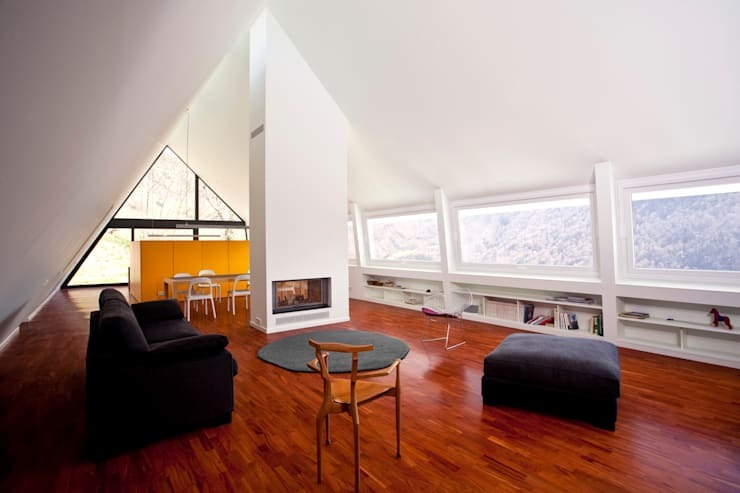 The orientation of the home was carefully considered in this project, as the home has been designed to provide excellent viewing of the mountains through numerous windows placed along the elongated walls of the upper floor. The base of the home pays homage to a preexisting structure contemporary with its rural neighbors, a simple rectangular base that uses the hillside as its back wall. Because of the steep incline, the land has been terraced, providing an excellent opportunity for the wide stone patio that extends from the base of the home. While the lower half retains a rustic, sturdy, and utilitarian character, the upper half brings a sense of energy, openness, and contemporary edginess. 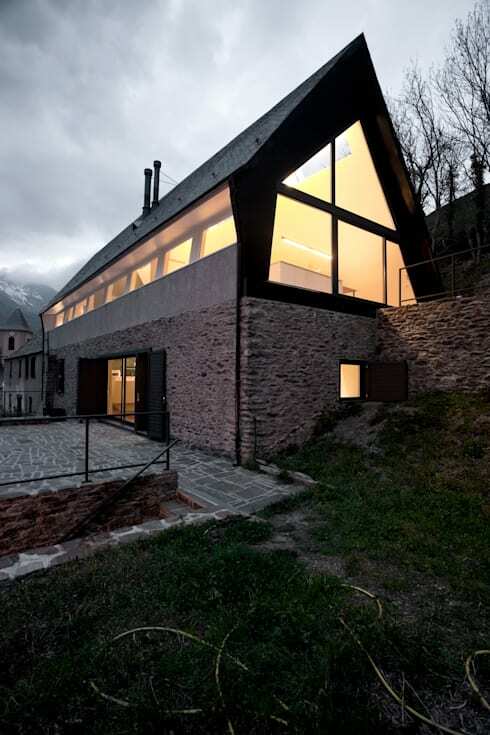 The idea was to combine new and old spaces, preserving the rural structure and respecting the historical context of the setting while also addressing any structural weaknesses of the antiquated building – for example, an especially crumbly part was replaced with the square window that you see tucked close to the hill on the lower half of the home. The main room on the upper floor is characterized by a sense of height and direction – this design is clearly intended to draw eyes towards the far-off slopes, with one side of the home covered in windows and the opposite side in solid plaster. Even the furniture has been oriented to face the array of windows – instead of an intimate, enclosed atmosphere, this living room design encourages a certain aloofness and contemplative thought. 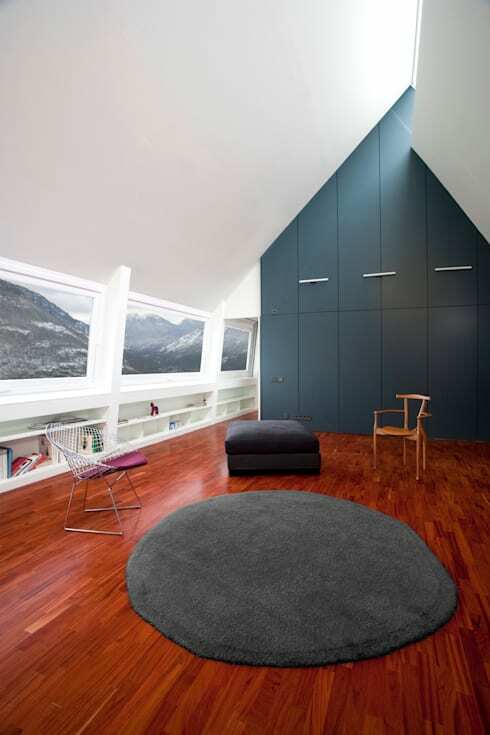 The interior of the modern section of the home clearly mimics the natural landscape, with a grey contrast wall forming a sharp, pointed peak within the home. While a few pieces of interesting contemporary furniture serve to anchor the room, the intentionally sparse decor scheme creates an airy atmosphere where negative space becomes the protagonist. Rarely does the kitchen enjoy such a privileged location within a home! this modern cooking space is flooded with sunlight and natural views, and the brilliant white and bright yellow colour scheme serves to magnify the upbeat energy in this kitchen. Although the lower level is defined by lower ceilings (traditional in this old farmhouse structure), strong vertical elements bring a sense of height to this open concept room. 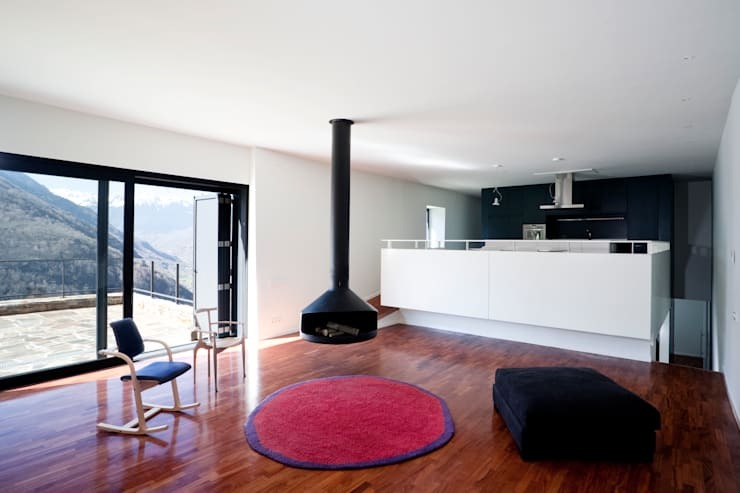 For one, the unique floating fireplace that dangles above the circular rug! 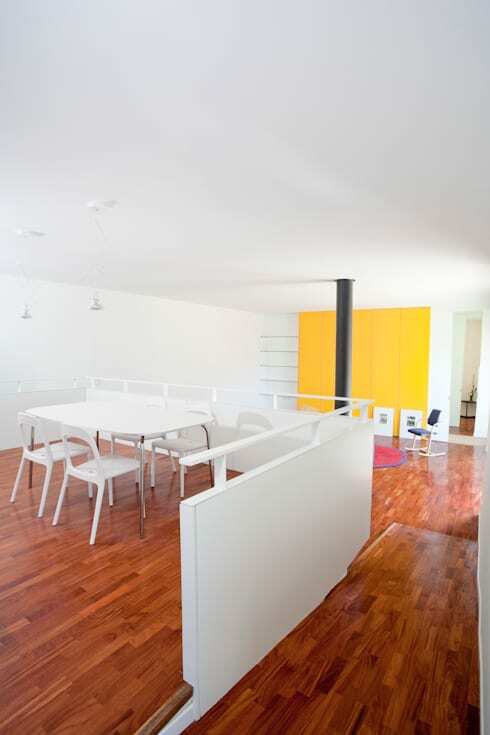 A stainless steel vent anchored to the ceiling in the other half of the room also gives visually lift to the room. The lower level enjoys a spacious dining area, as well as its own kitchen! This design allows the home to be neatly divided in two, allowing the residents to rent out either half of the home to temporary occupants. What do you think of this modern rural home in the mountains? Comment below!